This Day in Presbyterian History · August 30: William C. Cattell, D.D. August 30: William C. Cattell, D.D. Drawing again, in part, from Nevin’s Presbyterian Encyclopedia, we read today of a man who gave himself unselfishly to the establishment of a school. William Cassiday Cattell was born at Salem, New Jersey on August 30th, 1827, into the family of Thomas Ware Cattell and his wife Keziah Gilmore Catell. Raised with five other brothers and two sisters, William studied in local schools and later completed his preparatory studies in Virginia for two years, under a brother’s direction. He subsequently enrolled at New Jersey College and graduated in 1848. After teaching in Virginia for a year, he then began studies at Princeton Theological Seminary. Cattell completed the standard three year course and remained for an additional year to focus on what were then termed Oriental Studies. Graduating in 1852, he was employed as Associate Principal of the Edgehill Academy, located in Princeton, New Jersey, from 1853-1855. Thereafter he was ordained by the Presbytery of Newton in 1856. From 1855 to 1869, he was Professor of the Greek and Latin languages in Lafayette College, and it was during these years that he forged some of his strongest friendships and alliances. 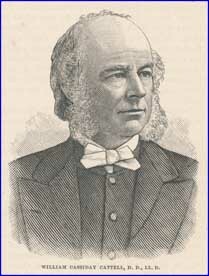 Then from 1860 to 1863, he was pastor of the Pine Street Presbyterian Church in Harrisburg, Pennsylvania, where his labors were crowned with success, and he was greatly beloved by his congregation. In 1863 he was elected to serve as President of Lafayette College, which position he accepted and occupied until June of 1883, when impaired health through over-work obliged him to tender his resignation. The effects of the Civil War had been nearly fatal for Lafayette College. Enrollment plummeted as students left for battle, while finances dwindled from lack of both students and supporters. The College was nearly closed in 1863 when the Trustees turned to Dr. Cattell, asking him to return and take over as President of the school. His congregation in Harrisburg was devastated, but he saw the greater need and in July of 1864 was inaugurated as President of Lafayette College. During his administration of twenty years, and mostly by his own efforts, the school’s assets increased from $40,000 to almost $900,000. New and larger buildings were built, and furnishings and equipment were brought up to date, along with the improvement of the curriculum. The end result was that Lafayette now stood among the leading colleges of that day. During this period, besides contributing $10,000 from his own funds for the construction of McKeen Hall, Dr. Cattell worked through these years at a very modest and nominal salary, devoting himself unselfishly to the interests of the College, to the point that his physicians finally had to compel him to absolute rest and freedom from official responsibility. In accepting Dr. Cattell’s resignation, the Board of Trustees gave in to the obvious but painful necessity. Following his retirement, Dr. Cattell remained an active member of the College’s Board of Trustees, serving there until his death in 1898. But the College was not his only field of service. Staying active, he traveled to Europe in conjunction with the Presbyterian Alliance, and upon his return, took on new duties as Secretary of the Board of Ministerial Relief for the Presbyterian Church, U.S.A. He traveled throughout the United States, preaching to raise money for aged pastors, their widows and orphans. During twelve years with this Board, Dr. Cattell raised three million dollars. Again, his ceaseless labors forced him to retire, this time in 1896. 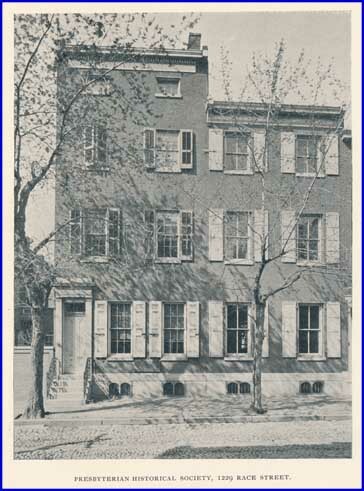 Yet despite his declining health, he agreed to accept the call to serve as President of the Presbyterian Historical Society, in Philadelphia. In this work, he fixed his sights on two goals: relocating the Society’s collections into a larger fire-proof facility, and the establishment of a sufficient endowment. Cattell lived to see the collections moved to a newer building, but died on February 11, 1898, before the other goal of an endowment could be realized. Dr. Cattell was a superior scholar, an accomplished and affable gentleman, of great energy of character, and an excellent preacher. He was vested with the confidence and regard of his brothers in Christ. Among the honors conferred upon him during his life, he received his degree of Doctor of Divinity from both Hanover College, Indiana, and New Jersey College, in 1864. The Lafayette College Archives, which consists primarily of diaries kept by Dr. Cattell. The Presbyterian Historical Society, which collection consists of Dr. Cattell’s sermons, lectures and addresses and incoming correspondence.